Georgia is under attack by an authoritarian power that refuses to recognize international law. This is a situation that Western powers have encountered many times before in Hungary, Czechoslovakia and Afghanistan. The US must take the lead in fiercely condemning Russian aggression, which is a threat not only for Georgian independence but for many other Russian neighbors such as Ukraine and the Baltic states where Russia also has territorial disputes. The issue before the world community not only concerns Georgian democracy and respect for national sovereignty, but how to control the growth of a dangerous imperial and authoritarian regime in Russia. Should Russia pursue its war with impunity, we can expect continuing instability in the Caucasus for decades to come. No new democracy will be safe or able to thrive on Russia’s borders. This is a decisive moment for Western policy toward Russia. Do we allow a Russian military victory in Georgia which will reinforce Russian militarism and further weaken its democratic forces (the Russian media is already a propaganda machine for the state), or do we take the proper action that will reinforce democracy and international law. The establishment of a new international peace keeping regime in South Ossetia to replace the failed Joint Control Commission controlled by Russia. If Russia fails to cooperate and continues bombing of Georgia and occupation of the parts of its territory, the international community must take the appropriate action including measures to ensure the diplomatic isolation of Russia. This is a decisive moment for Western powers and the Georgian Association hopes that both the USA and EU clearly recognize the danger to political stability in Europe that Russian actions present.
. The Georgian Association in the USA Inc.
A new Senate Resolution (S.Res.391) on the Latest News page under the title “The United States Senate Calls on the President of the United States to Engage in an Open Discussion with the Leaders of the Republic of Georgia”. Calling on the President of the United States to engage in an open discussion with the leaders of the Republic of Georgia to express support for the planned presidential elections and the expectation that such elections will be held in a manner consistent with democratic principles. Statement of Senator Obama on Tensions in the Caucasus Region Between Georgia and Russia. Only a political settlement can resolve the conflicts over Abkhazia and South Ossetia. Russia needs to roll back the aggressive actions it has taken in the last three months. The Georgian government must resist the temptation to be drawn into a military conflict. All parties must make clear that they are committed to a diplomatic settlement and will not seek to resolve this dispute by force. Washington, DC-On Wednesday, February 27, 2008, the Georgian Association in the USA along with its colleagues from the Central and East European Coalition (CEEC), representing more than 22 million Americans, discussed a range of policy issues with presidential candidate Senator Hillary Clinton’s advisor, former Secretary of State Madeleine Albright. Also present at the meeting was Lee Feinstein, Senator Clinton’s Campaign National Security Director. The Georgian Association was represented by Mamuka Tsereteli (President), Maka Gabelia (Executive Director), Zacharia Kiknadze (Member) and Nino Japaridze (Board Member). One hour long discussion was moderated by Nino Japaridze. The meeting focused on key areas of concern for the Georgian Association, including Russia’s actions against Georgia and Ukraine and other Central and East European countries, energy security and diversification, and NATO enlargement. Secretary Albright fondly remembered her collaboration with General John Shalikashvili as she recalled her work on NATO enlargement. “NATO enlargement, the removal of the divide between East and West Europe, opened up a new chapter in the history of Europe. John and I stood side-by-side during this momentous time,” Albright noted. Secretary Albright speaking on behalf of Senator Clinton reaffirmed Senator’s support for NATO’s “open door” policy. She welcomed Ukraine’s and Georgia’s aspirations for full NATO membership. Secretary Albright made it clear that the Membership Action Plan (MAP) criteria constitute a roadmap for full NATO membership, and MAP will be the measure determining the timeline of the actual membership in NATO for Ukraine and Georgia. 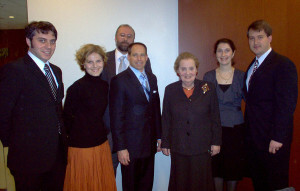 Albright expressed confidence that Senator Clinton would continue to advance issues of concern to the Georgian Association and the CEEC and she urged the group to remain engaged on the issues in Washington DC. Washington, DC-Today, Mamuka Tsereteli, President of the Georgian Association and Nino Japaridze, Board Member of the Georgian Association, along with few colleagues from the Central and East European Coalition (CEEC) spoke via conference phone with Dr. Ron Asmus, foreign policy adviser to Senator Hillary Clinton’s campaign. The discussion, which was a follow-up to a meeting with Secretary Madeline Albright and Senator Clinton’s Campaign National Security Director, Lee Feinstein held last week in Washington, DC, touched upon numerous issues of concern to the Georgian Association and the CEEC. The questions posed to Dr. Asmus touched on issues such as energy security in Europe and the United States, stability in the Baltics and the Caucasus, fostering of U.S. ties with the Central and East European region, as well as the assessment of Russia’s presidential elections. Dr. Asmus noted the importance of diversifying energy supplies to Europe and the United States and equated the importance of the Blue Stream and Nabucco projects to the significance of the Baku-Tbilisi-Ceyhan pipeline. Dr. Asmus said “Russia aggressively uses its energy resources as a weapon.” Asmus added that both the United States and the European Union should “tame Gazprom,” and apply competitive open market rules to Russian companies. The Blue Stream and Nabucco projects will act as catalysts in making Russia “play by open market rules.” “The oligarchic structures of Russia’s energy system must undergo liberalization,” Asmus stated. Asmus believes that real U.S.-EU cooperation will help “chip away at the current energy problems.” Asmus stressed Senator Clinton’s view of the importance of more active U.S.-EU collaboration in dealing with these ongoing energy security issues. Many members of the CEEC expressed their disappointment with the White House’s reaction to the Russian presidential elections. Asmus explained that new policies are needed to deal with Russia. According to Asmus, “Washington’s Russian policy has exhausted itself. Current policy is not working as Russia is becoming more authoritarian. The Bush Administration has not placed enough focus on Russia. As a result, Russia continues to bully neighboring countries and challenge U.S. interests in the Central and East European region. Russia’s violations of Baltic air space is a useful illustration of Russia’s aggressiveness.” Asmus believes the next U.S. president will need to form new policies toward Russia. Asmus opined that the right policy towards Russia will include progress on Ukraine’s and Georgia’s desire to join NATO. Asmus indicated that a “democratic and secure Ukraine anchored in the West is the best thing for Russia.” He noted that Ukraine’s and Georgia’s membership in NATO should not be threatening to Russia. He believes the United States must assist former Soviet countries in their consolidation of democracy. Dr. Asmus emphasized to members of the CEEC that Senator Clinton and her team will continue to keep Central and East Europe and Russia in focus and expressed desire for a continued dialogue with our communities. The CEEC members present thanked Dr. Asmus for his candid discussion today. The Georgian Association Organizes First Lady’s Visit To Capital Breast Cancer Center In Washington, DC. CBCC provides breast cancer screening services and breast health education to women who do not have health insurance or other means to pay for mammograms. Breast and cervical cancers are the leading causes of death among Georgian women. The First Lady of Georgia dedicates much of her time to the work in health care. She chairs the reproductive Health Council under the Ministry of Labor, Health and Social Affairs of Georgia. The Council made it possible to establish the first breast cancer screening center in Tbilisi. At this center, women between the ages of 40-69 who live in Tbilisi receive free mammograms and consultations. The aim of the program is to ensure access for the target population, make the services acceptable and appropriate to the needs of eligible persons, maximize early detection of breast cancer, and therefore, help reduce mortality from breast cancer. Also, First Lady is Founder and Director of SOCO, a charitable organization, which works to improve reproductive health and child welfare in Georgia (www.soco.ge). CBCC Executive Director Amari Sokoya Pearson-Fields, MPH, and Medical Director Jennifer Eng-Wong, MD, MPH, hosted the meeting. They shared with Roelofs valuable information about breast cancer prevention activities, patient support mechanisms, funding challenges, and creative ways to raise awareness about importance of annual breast screenings. Dr. Levan Jugheli, the Medical Director of the Tbilisi Breast Cancer Screening Center, and wife of the American Ambassador in Georgia accompanied first lady at CBCC. They, also, met with representatives of March of Dimes, the Susan Comen Foundation, and visited the National Institutes of Health (NIH) during this visit to the United States. First Lady Roelofs hopes that the Tbilisi Breast Cancer Screening Center can serve as a blueprint for similar facilities in rural areas of Georgia, where the need for cancer screening services for women is urgent. The Georgian Association Meets With Senator McCain’s Foreign Policy And National Security Advisors. Washington, DCOn Thursday, March 13, 2008, Senator John McCains senior campaign advisors met with the Georgian Association and colleagues from the Central and East European Coalition (CEEC), to discuss policy issues that are important to Georgia and the coalitions ancestral countries. Randy Scheunemann, Director of Foreign Policy and National Security, Stephen E. Beigun, Campaign Advisor and Aaron Manaigo, National Coalitions Director represented the Senator. The discussion focused on key areas of concern for the Georgian Association: NATO enlargement, Russian actions against Georgia and Ukraine and other Central and East European countries, and energy security and diversification of supply. Mr. Scheunemann assured the meeting participants that Senator McCain is a strong supporter of NATO enlargement, and has been actively lobbying Congress for this issue since the 1990s, during the first round of enlargement. The Senator does not believe that Georgias membership in NATO should be tied to the resolution of the so-called frozen conflicts of Tskhinvali and Sokhumi. He fears that this conditionality will only give Russia an incentive to keep the conflicts unresolved. As a President of the United States, Senator McCain would enhance transatlantic relationships with Europe. He would raise the issue of a more cohesive policy toward Russia with European allies, and elevate issues such as MAP for Georgia and Ukraine. The Senator believes that the United States must hold Russian leaders accountable for their policies inside and outside of Russia. Mr. Scheunemann voiced Senator McCains concern over Russias use of energy for political leverage, and his support for the development of a common energy policy with Europe to avoid Russian monopolization of European energy supply. Senator McCain believes this important issue is a matter of national security for the United States. 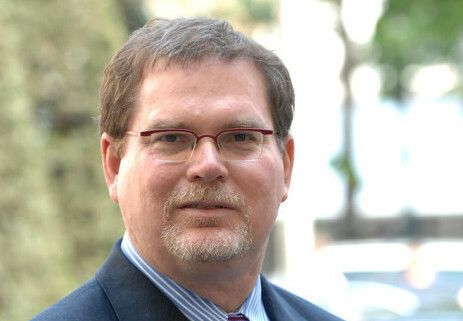 Senator McCains advisors expressed confidence that their presidential candidate would continue his deep commitment to resolving the issues of concern to Georgia and other Central and East European countries. Washington, DC-On Friday, February 29, 2008, Mamuka Tsereteli, President of the Georgian Association and Nino Japaridze, Board Member of the Georgian Association, along with representatives of the Central and East Europe Coalition (CEEC) met with Anthony Lake, Ph.D., senior foreign policy advisor for Senator Barack Obama’s 2008 presidential campaign. Joining Dr. Lake, and facilitating the meeting, was Mark Brzezinski, also a well-known foreign policy expert. In his opening remarks, Anthony Lake touched on many important issues of concern to the member organizations of the CEEC. “This meeting gave the Georgian Association the opportunity to discuss issues of mutual concern and interest and we look forward to working closely with policymakers in Washington on these key issues for our community,” Mamuka Tsereteli noted. Washington, DC. The Georgian Association in the USA was dismayed by some of the provisions of the recent UN resolution on Georgia. On October 13th, 2006, the UN Security Council unanimously passed Resolution 1716 which prolongs the mandate of UNOMIG (the United Nations Organization Mission in Georgia) in the Abkhazian region of Georgia. UNOMIG was set up in August 1993 following an agreement to end the armed secessionist conflict in Abkhazia and currently has 121 military observers and 12 civilian police officers in place, as well as nearly 300 civilian staff members. The Georgian Association objects not to the extension of UNOMIG’s mission, which the Georgian government and the majority of the Georgian people support, but to the distorted information contained in the resolution. Furthermore, the US government’s participation in the drafting of the resolution suggests to us and the rest of the world that the US administration has shifted its policy towards tolerance for Russia’s de facto annexation of Georgian territory. The resolution declares that the “new and tense situation” in Georgian-Abkhazian relations resulted “at least in part, from the Georgian special operation in the upper Kodori Valley”, a part of Abkhazia still under Georgian government control. 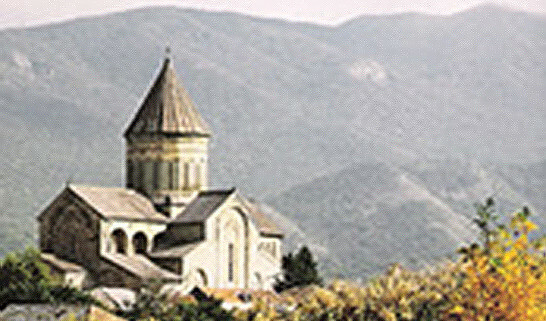 In fact, the Georgian government reduced tensions in the Valley by its special operation which ended the lawless rule of Georgian bands there this July. Since October, the Georgian government has permitted Russian dominated CIS peacekeeping troops to monitor the situation in the Upper Kodori Valley. Such monitoring was not possible before the Georgian operation. The one-sidedness of UNSC resolution 1716 is reflected in its condemnation of the Georgian government for “militant rhetoric and provocative actions” and its praise for the CIS peacekeeping troops and their “stabilizing role.” In reality, the CIS peacekeepers have proved completely ineffective at protecting the local Georgian population and have regularly participated in anti-Georgian actions in Gali and other regions of Abkhazia. This is why the Georgian government is asking for the replacement of CIS peacekeepers with an international force. This resolution is a step backwards and a disappointment to the Georgian people who have come to expect US government support for its attempt to protect Georgia’s sovereign rights and its citizens in the territory of Abkhazia. This resolution comes at a time when the Russian government is persecuting Georgian citizens and Russian citizens of Georgian origin in Russian cities following the Georgian government’s arrest – and later return – of Russian spies this October. This anti-Georgian campaign orchestrated by the Russian government has led to the closure of Georgian businesses in Russia, the illegal and often forced entry into Georgian homes by Russian officials, pressure on the Russian Ministry of Education to supply information on Georgian pupils, and the forced deportation of Georgians. It is a dangerous policy of cleansing that reflects the anti-democratic and authoritarian policies of the Russian government. US support of UNSC resolution 1716 condones Russian de facto annexations abroad and ignores Russian discriminatory policies at home.